Our trailer doesn't have a cable port for hooking up to cable/satellite tv. Where have other members installed them? Or have they found a way to run a cable into their trailer without doing that? My main dilemma is that the hookups are generally streetside, but our tv is generally positioned on the curb side, so I am thinking that a port on the curb side might work better? I just ran a length of coax from the antenna jack/12v recepticle over the fridge (replaced the original recepticle w/ a modern coax connector/signal amplifier; overhead antenna terminates in this same box) , down along the side of the fridge vent. there was a small gap at the back edge of the counter over the fridge, so it was no problem to snake the cable down there behind the refer. then I tucked it through the vent screen in the floor to get out the belly of the trailer. from there, I ran it across the belly over to the curbside, attaching it to the belly pan w/ cable clips and sheet metal screws. (along the front edge of the freshwater tank). I left some extra length at the end, so it would stick out about a foot. when not in use, I loop back that last foot under the trailer and snap it back into the last clip, which holds the end securely in place, completely out of sight, just in front of the streetside wheel well. When parked at your typical campground space, its in close proximity to the utility hookup. I have another length of cable that I can use to make the connection between this cable and the camp utility pole. it took all of 30 minutes to do this...no snaking wires through walls or cutting into the exterior or interior skin. When I replumbed my trailer it left a hole through the belly pan where the high pressure relieve valve went. So I used this to route a coax and phone cable up through the hole and into the clothes closet. Then I routed it behind the upper cabinets to where the TV shelf is. I cut in a box in the bottom of the upper storage shelfs. Turned out nice and is something we use every time we camp. Beats running a cable out the window! Picture shows the outside connection. 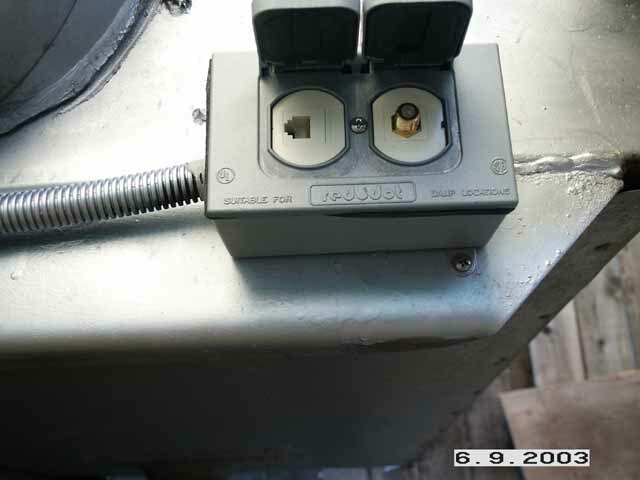 On our 1971 23' Safari, I put a cable connecter on the street side next to the water heater. Bought it connector at Camping World for a few bucks. I then ran the cable through under the stepover to the bath/shower, through the battery compartment and then under the curb side bed and up through the back of the fridg and connected it to a box for the new Batwing antenna. Now, I just push a button for the antenna and do not push it for cable. Works lide a charm. I replaced my original TV antenna panel on the inside of the trailer with an amplifier, which includes a 12V outlet for a small TV. This new amplifier panel has inputs from cable, or from the TV antenna. Then, I ran a coax cable through the closet down to where my water heater lives. There was enough space next to the water heater to drill a 1in hole through the inner skin, then another smaller hole ( i forget the exact size, the coax connector determines this) through the outer skin. Now I inserted a coax connector through the outer skin and mounted it with a simple stainless washer and nut, with the longer end of the coax connector sticking towards the inside.The connector has a flange on it, perfect for this purpose.Apply some par bond to seal the flange. Just screw the coax cable on this connector, the other end to the TV amplifier, and as Dan Brawner suggests, a push of the button selects either cable tv or antenna. All you see on the outside is a small threaded stub somewhere near the water heater. I put a small threaded cap on it when not in use. I believe that this is a very solid and permanent installation.